Back in July 2013, Inoage launched the leading-edge feature set for the LED lighting controller MADRIX to fully control 3D LED projects. The powerful software now packs both, pixel mapping and voxel mapping, into a user-friendly software to control unique 2D installations and real 3D LED setups. Only 4 months later, the MADRIX 3.1 update includes a new round of features. The number of stock library effects has been increased from 39 to 46 (i.e., SCE Fill Drops, SCE Fill Snake, SCE Fill Solid, SCE Swarm, S2L Color Scroll, S2L Level Shape, M2L Color Scroll). As always, all effects can be combined quickly and easily, mixed together, and fully customized to the users’ needs. MADRIX 3.1 also improves 3D Mode for the Previews. By adjusting the new Voxel Pitch option, users can set up the effect previews to reflect the actual 3D installation and pixel pitch of utilized LED fixtures even better. Slices are another brand-new feature. Users can use the feature to import 2D images, 2D video streams, or 2D video feeds and map them onto 3D LED matrices. The content is automatically sliced into different parts and each slice is easily applied to X-Levels, Y-Levels, or Z-levels as required. 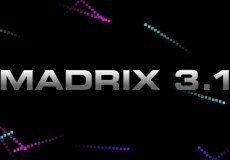 MADRIX 3.1 is a highly recommended and free update for all MADRIX 3 users. It also includes numerous other features, performance and stability improvements, as well as new fixture profiles. At the same time Inoage continues to support the previous software series, MADRIX 2. The new update MADRIX 2.14f is a free update for all users that brings a large number of stability and feature improvements to continue to make sure that MADRIX is the reliable tool operators have come to appreciate for great LED lighting designs around the world. Join Inner Circle Distribution and MADRIX for LDI Show 2013 in Las Vegas. Don't miss this opportunity to get in touch, for hands-on presentations, and more!